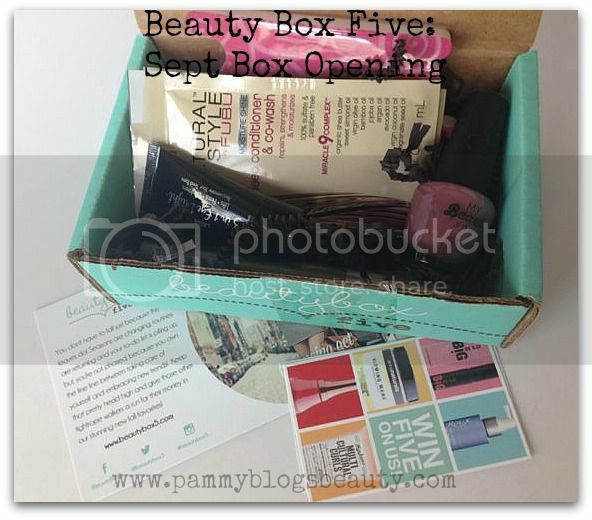 Pammy Blogs Beauty: Beauty Box Five: Sept 2014 Box Opening! 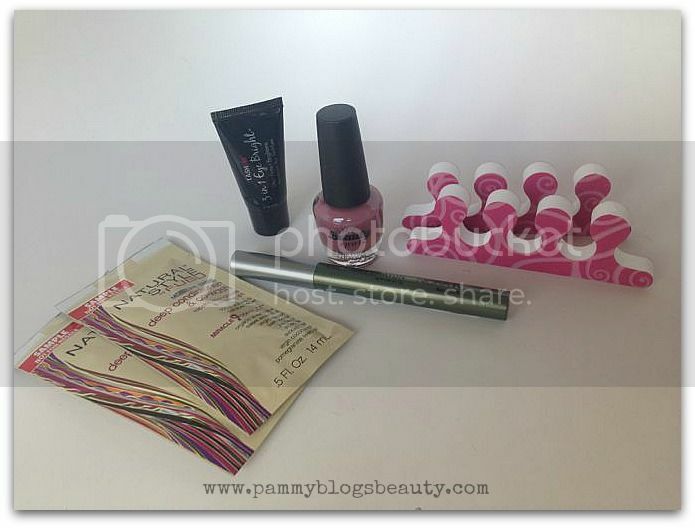 Beauty Box Five: Sept 2014 Box Opening! Beauty Box Five: August Box Opening! Hi Lovelies! It is time for another Beauty Box Five box opening post! :) As a huge fan of beauty sample boxes, I always eagerly await their arrival. It is always interesting to see who has the "best box" each month. Not to mention, I love discovering the beauty gems inside. What is Beauty Box 5? Beauty Box 5 is a monthly subscription service that delivers 5 cosmetic samples to your door for $12 a month. The samples are all deluxe and sometimes the boxes include full-sized products, too! Shipping is free on every box. :) When you subscribe to Beauty Box 5, each month you get a beauty box delivered right to your door! The boxes contain a mix of makeup, beauty accessories, skincare, fragrance, bath& body items, and nail products (Not all of these this month, but something from those categories). Beauty Box 5 is a great way to discover new products or get yourself out of a cosmetics rut! This Month's Box: Beauty Box Five wants you to try their Fall Favorites! With the change of season, what better time to try out some new products? I know that I always switch things up when the seasons change. From skincare to makeup colors, it all rotates! Nicka K New York | Eyelight Crayon (retail: $4.49, Full size!!! ): Yay for a Full Sized product sample! :) This is a line that I am not that familiar with. So, I am happy to try out this pretty shimmery neutral green retractable eye crayon. Natural Style by FUBU | Deep Conditioner & Co-Wash (sample size: 2 foil packets, Full Sized cost: $9.99): This is interesting...this product can be used as a conditioning "wash" for curly haired girls or as a deep conditioner for all hair types. I wish the sample was larger. However, they did send 2 packets. So, that will probably be enough for my super long hair. I tend to use a lot of product! Sally Hansen | Toe Spacers (retail $1.99 per pair, Full Size! ): Funny, I didn't have any of these for awhile and now my past two beauty boxes included these, lol! I do love these types of toe spacers for when I do pedicures. I love the cute swirly design on these. These will certainly be put to good use right away! Chrislie Formulations | 3-in-1 Eye Bright (full size .5 oz retails for $40.00, sample size: .17 oz): I need all the brightening that I can get in the eye area! This is a line that I have recently started to explore. So, I am happy to have a sample! This eye serum smooths, brightens, and firms. With the exception of the small foil samples for the Natural Style FUBU Deep Conditioner, I am super impressed with the sizes of the full sized and deluxe sized samples in this month's box. Really, a good value! My favorite sample this month is, for sure, the polish! I can't wait to wear it!!! How did you like your BB5 this month?